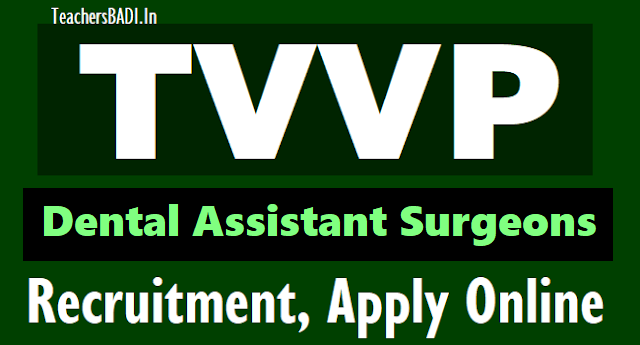 TVVP Dental Assistant Surgeons Recruitment 2018, Apply Online / TS Dental Assistant Surgeons Recruitment 2018. Telangana Vaidya Vidhana Parishad has given the Dental Assistant Surgeon Posts Recruitment 2018 notification and Applications are invited through Online @ tvvprecruit.telangana.gov.in from the eligible candidates for appointment on regular basis to the posts of Dental Assistant Surgeon in various specialities in the Government Hospitals functioning under the administrative control of the Commissioner, Telangana Vaidya Vidhana Parishad, Telangana State. a. The following certificates must be uploaded at the time of submission of online application. a) Permanent Registration Certificate of additional qualifications PG Degree/PG Diploma qualification in Telangana State Medical Council/AP Medical Council. b) Contractual Service Certificate as per Annexure-I from the controlling officer i.e DCHS/Superintendent of the concerned District Headquarters/ DM&HO/Superintendent of the Teaching Hospital /Principal of the Medical College in case the candidate worked / working on contract basis. If the contract service certificate in the prescribed format is not uploaded , the candidate will not be given any weightage for contract service. b. The following certificates must be kept ready by the candidates for the purpose of verification. ii. Proof of Educational Qualifications /Professional Qualifications. vi. Proof of permanent registration of P.G qualification with Telangana State Medical Council / A.P. Medical Council. vii. Contractual Service Certificate for the contractual service rendered in Urban/Rural/Tribal issued by the competent authority as uploaded in website. d. The following Certificates (whichever is applicable) should be obtained from Competent Medical Authority for the purpose of verification. 2) Candidates pursuing any other PG course are not eligible to apply. 3) The above appointments are purely temporary and likely to be regularized as per the rules. 4) Candidates selected shall be posted to District Hospitals, Area Hospitals, Community Health Centres and Maternity & Child Health Centres. 5) They should stay at the Headquarters compulsorily. 6) Selected candidates shall be liable to serve in any part of Telangana state. If selected he/she should join in the place where he/she is posted within the stipulated time, failing which the selection stands cancelled. Fee and submission of Application Online: The fee prescribed for applying for Dental Assistant Surgeons (Specialists) posts is Rs.600/- (Rupees Six Hundred Only) towards online Application Processing Fee. Candidates can pay the fee through payment gateway/credit/debit card/net banking between 18-04-2018 to 17-05-2018 and submit online application at the website www.tvvprecruit.telangana.gov.in between 18-04-2018 to 17-05-2018. Procedure for submission of application online: Detailed procedure for applying ONLINE mode is given in the Information Bulletin. Candidates can download the “Information Bulletin” free of cost from the website www.tvvprecruit.telangana.gov.in from 18-04-2018 onwards. Eligible Candidates shall submit their applications through online from 18-04-2018 to 17-05-2018. Eligible Candidates shall submit their applications through online from 18-04-2018 to 17-05-2018. 1. Submission of ONLINE applications through ONLINE mode from : 18-04-2018 onwards. 2. Last date for submission of ONLINE applications :17-05-2018. The Online Application will be available from 18.04.2018 at 5.00 PM.